I was lucky enough to attend last week’s Harry Potter premiere, which means I walked away with a pair of very special 3D glasses in the shape of Harry’s glasses. All this Pottermania has got me feeling a little nostalgic. While I’m not one of those people that can claim to have been there from the proverbial beginning, I did read the first four books in the series a few months before the first movie, so for the final movie to come out really IS the end of an era for me. 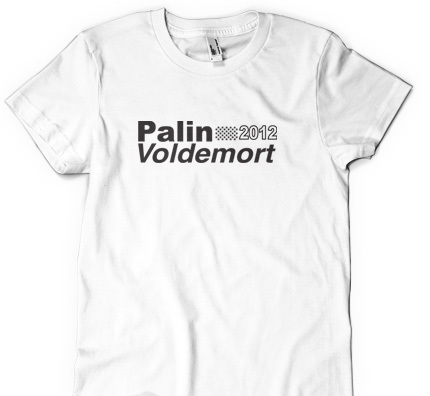 At least until JK Rowling launches her rumored prequel to the series…Anyway I’ve seen a LOT of cool Potter merchandise over the last little bit, so I thought I’d round some of it up here. While these aren’t the be all and end all for the top five coolest singular items, these are five very valuable resources for buying Harry Potter gear. Warner Brothers is well-known as the official distributor of the Potter films, and as such, they have a pretty impressive array of goods. From pricy replicas of Harry’s invisibility cloak (guaranteed to make you uninvisible) and Hermione’s Yule Ball gown to exclusive, customizable pieces like the plaquemounted acceptance letter above, you’re guaranteed to find something for your Potter fix here. I particularly like the letter has a way to integrate your favourite fan into the story – like say, as a birthday gift a la Harry? Shipping is $15 to Canada and usually takes about a week, although shipping is promised to be a flat rate (unless you make a giant bulk order). 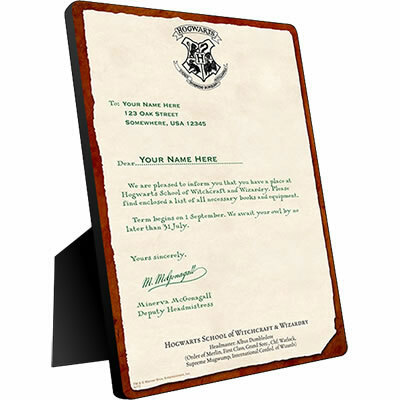 Want to decorate a special corner of your home or office with a piece of the Potterverse? Harry Potter wall art takes your favourite moments and items from the films and produces them in a range of sizes to stick up on any clean, non-porous surface. Whether you’re theming a kid’s room or decorating the movie-watching room in a friend’s place, you’ll definitely find a range of lifelike, dramatic options here. Oh and they do ship to most of North America…so you better believe Canucks can score some art from these guys. 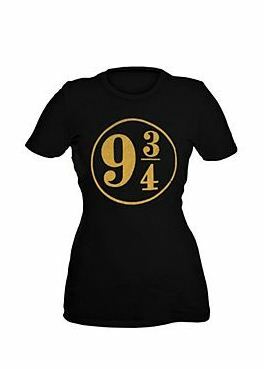 A girl at the premiere I attended had this uber cool and stylish Platform 9 3/4 shirt, and I was Slytherin green with envy! Luckily I tracked it down at US retailer Hot Topic, which has a pretty impressively fun and fashionable collection of HP gear. Be sure to check out the gorgeous Slytherin and Gryffindor retro varsity-inspired cardigans while you’re browsing – all of these are awesome gift ideas for your gal pals in particular.Once again, Hot Topic ships to Canada – costs are calculated at check-out based on weight. The Noble Collection is probably one of the first, awesome companies I ever came across that produces really incredible replicas from the films. They literally recreate every little detail they can get their eyeballs on – unlike WB Shop, who mainly focuses on the most memorable pieces. 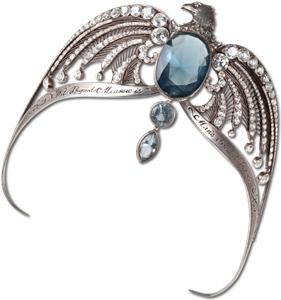 Do you covet Hermione’s Yule Ball earrings or the crystal necklace she wore at the wedding in the seventh film? Sure, why not? 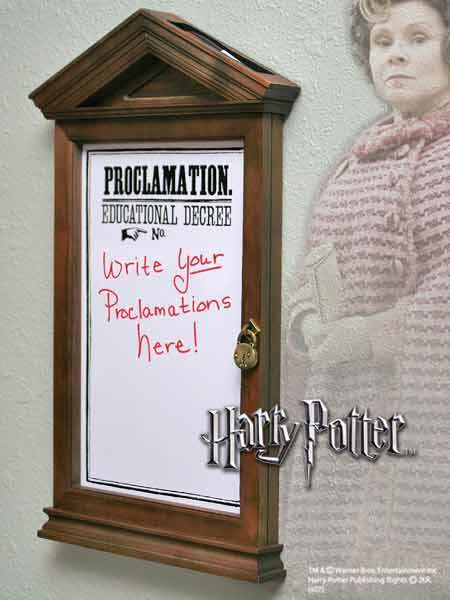 Wands, metal pieces, and jewelery are definitely the company’s focus, but I zeroed in on this nifty dry-erase Proclamation Board as a fun way to bring a little magic into a household, without slapping the Hogwarts crest and colours everywhere. Consider it a fun gift for parents of particularly imaginative children. The company does ship to Canada, for $5-$20, depending on how much you’re spending…and trust me, it’s easy to spend lots here. I’d be remiss if I didn’t mention a few of the really beautiful designer interpretations of the series. With so many designer-submitted tee sites out there, I thought I’d throw a few at you. 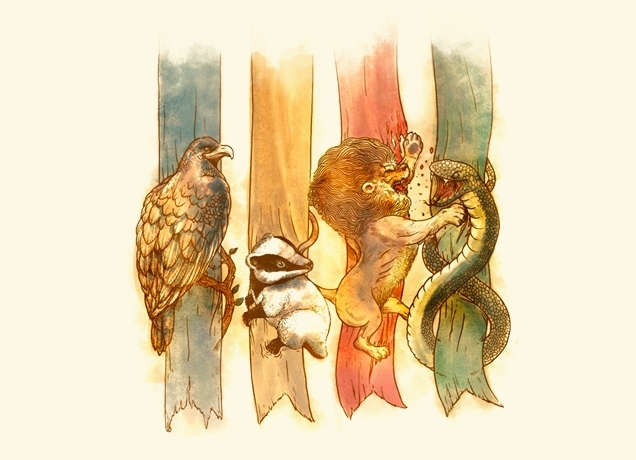 The one above is from Threadless, and can be produced as a men’s, women’s, or kid’s tee or hoodie. “Trust in Harry. He’s the best hope we have.” Don’t quote me word for word or kill me Lupin, but I believe those are the last words Dumbledore said to you and Kingsley Shacklebolt. If you loved the style of the infamous Obama ‘Hope’ posters you’ll love the Americana (or arguably, Imperial-inspired) interpretation of Harry on this tee. 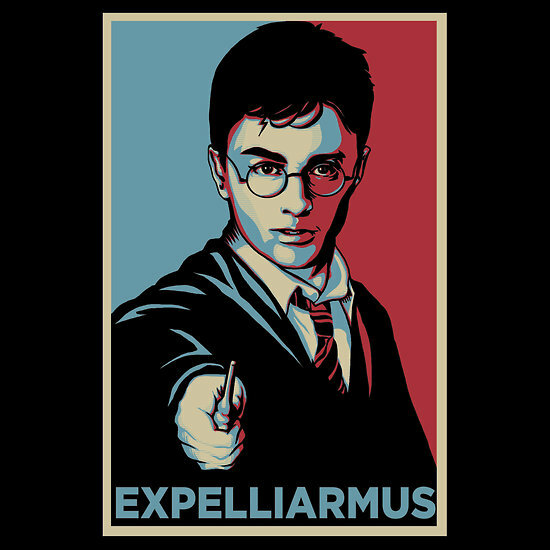 For the record, Red Bubble easily has the best selection of artsy, interesting interpretations of the boy wizard and his story. Ch-ch-check em out. If you like a little politickin’ with your parody tees, this low-on-style, high-on-concept option is available for lads, ladies, and zip-up fans in a range of colours.